A picturesque early Victorian terraced house within this peaceful riverside enclave between Hammersmith Bridge and The Broadway. The house has a well designed and tastefully decorated interior as well as great light and character. Arranged over three floors, with top floor master suite; refitted bathrooms and a particularly spacious open kitchen / entertaining space on the lower floor with open fireplace and original floorboards. There are entrances on two levels and front and small rear courtyards as well as a roof terrace. 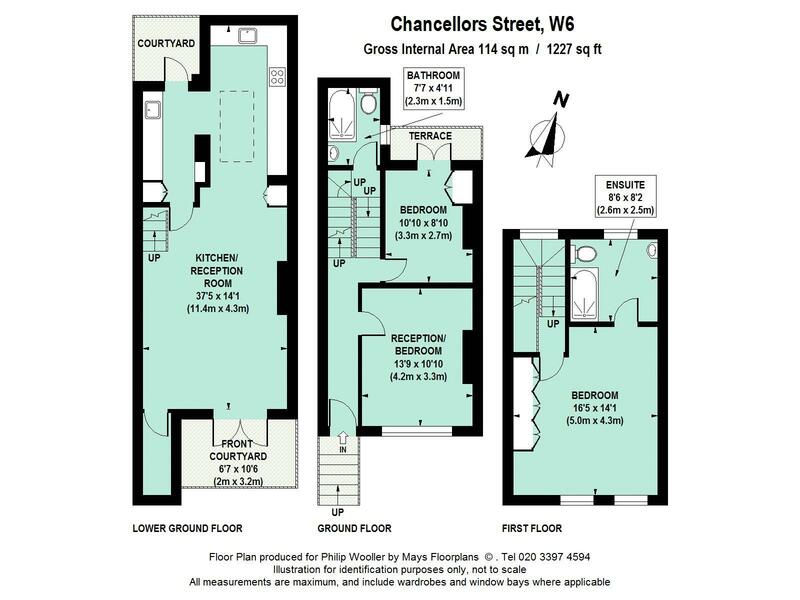 Chancellors Street is a quiet cul de sac running off Crisp Road and has always been a popular spot near Hammersmith Bridge and river. The transport and shopping facilities of Hammersmith Broadway and King Street are minutes away - as are glorious riverside walks and numerous good bars and restaurants. 1227 sq ft / 114 sq m approx.